To me, “Slovak cooking” is more than just recipes from a certain small central-European country. Slovak cooking is a way of life. This way of life is not linked to any particular country. Instead, it’s the way of the times past, times when people lived in harmony with their environment, leading life of sufficiency. In those times, people grew their own food with care, and with care learned to utilize it to its fullest potential. I like this way of life. The modern way is the way of excess. We define ourselves by our “streak of lightning cars and fancy clothes” (as Johnny Cash noted). Christmas, which should be devoted to spending time with family and friends, has turned into a mad dash to buy presents and then return them the following day. Allan Stevo from 52insk.com mentioned in his latest post that he found it surprising that in Slovakia many shops still stay closed on Sunday and also during Christmas. I say to that, keep it that way! To me, Slovak cooking is not the foods nor the recipes, it’s the process. Watch any modern cooking show, and it will surely be dominated by a discussion of the various gadgets and gizmos you need to buy prior to attempting to recreate the recipe. I bet that these days many folks think it’s straight impossible to bake bread without having a bread machine – or peel an avocado without a dedicated peeler (avocado peelers are a pet peeve of mine). Yet our ancestors didn’t have any of that, and yet were able to feast on amazingly delicious dishes. Some of the best food I have ever eaten was cooked by my grandparents, often using not much more than a pot and an old wood-burning stove. 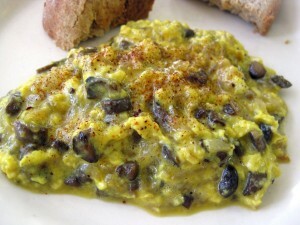 Speaking of reuse, here is a recipe for scrambled eggs (praženica) with mushrooms (huby). I made these eggs with the stems left over from baking mushrooms with bacon. 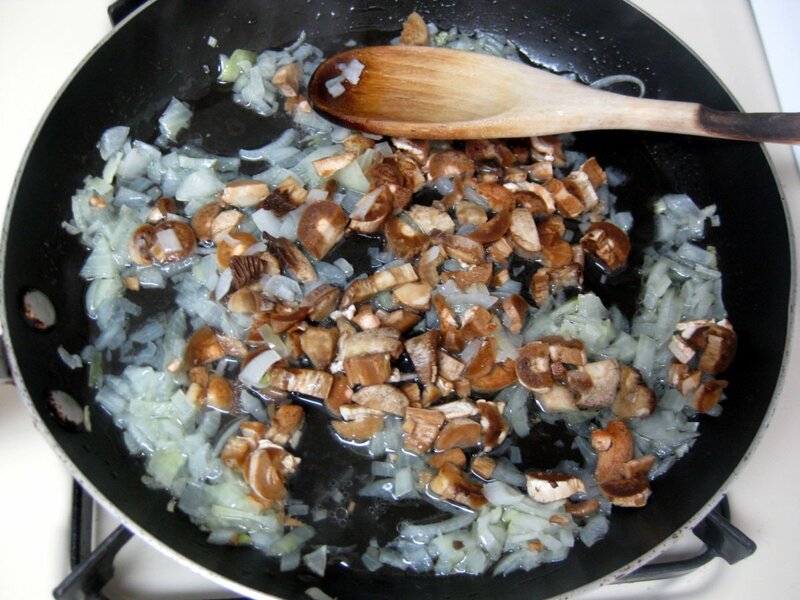 This combination is very popular in Slovakia, and it’s the most common way to prepare gathered wild mushrooms. Unfortunately it also leads to fatalities when a poisonous mushroom is inadvertently mixed in and ends up contaminating the rest of the dish. But no worries, you should have nothing to worry about if you stick to store-bought varieties. If you have never had scrambled eggs with mushrooms, try this combination. It’s very tasty! 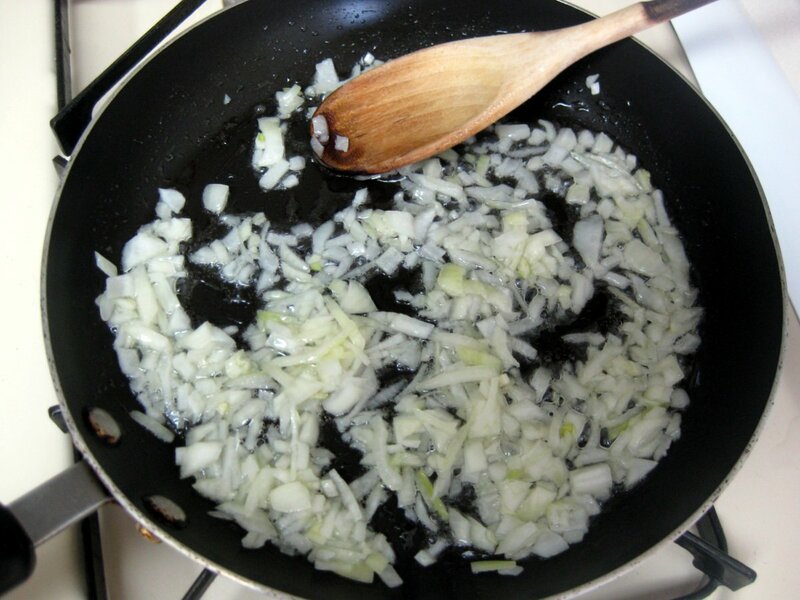 Start by peeling and chopping up the onion (cibuľa). Fry it on oil for about 3 minutes until it starts turning yellow. Then add the chopped up mushroom pieces and also a small cup of water. Cover, and let cook on low heat for about 15-20 minutes until the mushrooms are soft and most of the water stored in the mushrooms has evaporated. To help the water evaporate, you may want to remove the lid the last few minutes. 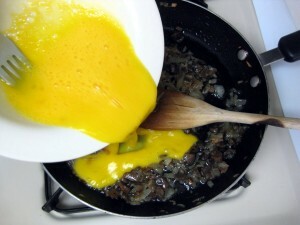 Then crack the eggs (vajcia) into a bowl, add a dash of salt, and scramble with a fork till bubbles start forming. Pour into the pan. Keep stirring. It’s better to have the heat on low. I like the eggs watery like shown in the photo. I turned the heat off moments before they were the way I like them, and let them finish cooking on the plate. Top with chives, paprika, or peppers, and serve with a good bread. We certainly think alike regarding family values, Lubos. I was raised very similar to what you mention here, and I would be quite happy to see stores once again closed on Sundays, although I don’t think that trend will be recurring in this country. This recipe looks very much like a Sunday brunch meal which we enjoy on occasion. I am amazed by the number of recipes that you feature which I have grown up enjoying, never realizing that there was a Slovak connection! Thanks, as always, for continuing to feature Slovak meals. Your site is super wonderful!!!!! love the step by step and the pictures – it’s just great! Do you think you could post a recipe for “huby na smotane”? My mom made the best ones… unfortunately I don’t have the recipe. My dear beloved grandmother (babinka)used to make green peppers (from her own garden) with eggs. Very similar to this recipe ,you cook sliced green peppers for about 20min until soft then add couple of scrambled eggs , salt , pepper. Although this dish is best to eat the next day after refrigerating overnight. This way the juice from peppers soaks the eggs which gives it wonderful flavour.We used to eat it cold with slice of fresh bread. It used to be a seasonal dish, since all home grown fruit and vegies were riping late spring – summer. Which reminds me of another favourite sasonal dish – bob – fava beans/broad beans. Couldt get enough of those either. Another seasonal variety of this dish is substituting the mushrooms with (or in addition to) red radishes. Simply slice these thinly and fry a little till they start to soften then add the eggs. Wow that’s wild! I have never heard of that. Will definitely try it as I very much like radishes. My Colombian girlfriend makes her scrambled eggs with corn. That to me is really strange. using radishes is interesting though I never had it that way. I just slice radishes and eat it raw with scrambled eggs. Never had fried radishes, I’ll try it sometimes. Miri try not to fry the radishes too much, they are nice if they are still teeny bit crunchy. I come from Slovak Czech boarders so maybe it is a western Slovakia thing? thanks Zdenka, you are right, not to fry it too much. I was afraid that frying it may turn it into soggy thing. This recipe brought me back to breakfast in which my Uncle Ed Wasko made eggs with papinki mushrooms! I shouldn’t be surprised to learn it was a Slovak recipe!